What can be said about Nevermind that hasn't already been said 1000 times? It changed music as we knew it...blah blah blah. I suddenly wanted to be a sad slacker in a flannel shirt. 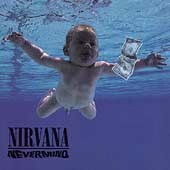 It was with 1993's release of In Utero that my feelings about Nirvana and Kurt Cobain changed. With Nevermind I was simply obsessed with the music and the image, but didn't really think about the fact that this guy...Kurt Cobain...really meant the things he was saying. Gen X wanted to believe he was a voice for us, but didn't really want to believe that his issues were real. It was supposed to just be a metaphor. When I listened to In Utero the truth about Kurt became painfully obvious. He was hurting and as bad as I wanted to be that way too, it just wasn't true. I was a happy middle class kid without a clue how it felt to be him. Nirvana did to it's audience with In Utero what Faith No More did to it's audience with Angel Dust. They lashed out against their sudden commercial success. 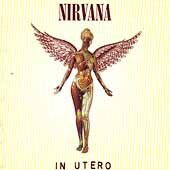 In Utero isn't as slick as Nevermind; it's mysterious, darker, and above all else - sadder. Speaking of...I have a little "Nevermind" surprise for you later in the week! will hole make the top 3? i think its important to remember that kurt was a sarcastic person and he always put music before lyrics so i dont know if you can really even know what hes singing about most of the time i mean smells like teen spirit what the hell is that about and you may think you know but someone can argue just as strongly that it means something else.